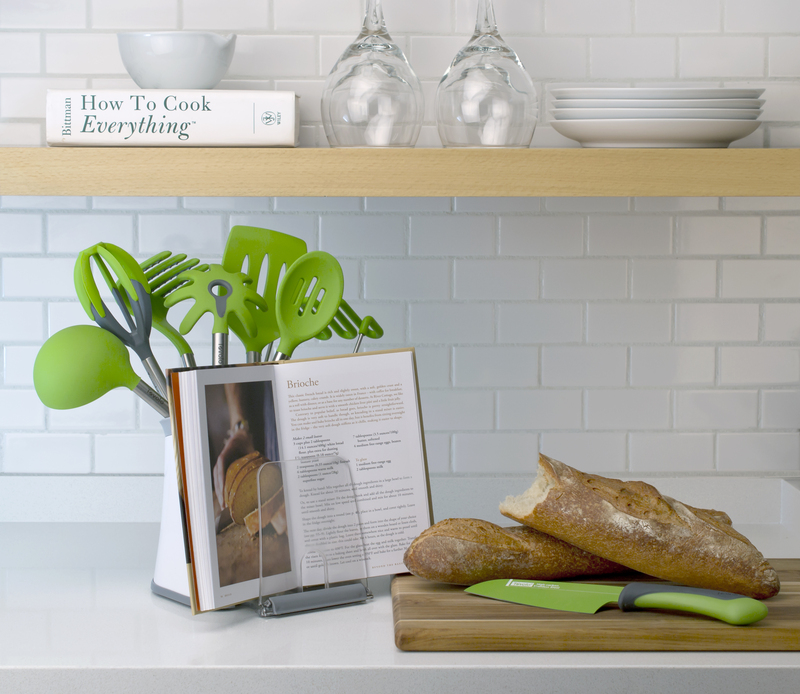 UTENSIL HOLDER WITH BOOK STAND & GIVEAWAY! The winner is Fork and Forage! This post is sponsored by Usefulthings.com. Opinions expressed are 100% my own. Being a food blogger, I have every kitchen tool known to woman. I have my favorite kitchen tools, which are my cutting boards, sharp knives and bowl scrapers. I am always happy when I can organize my tools where they are visible and I can grab them quickly when prepping and cooking. One of my favorite things when cooking, is having everything organized and being able to find it in a snap. That’s why I love my UTENSIL HOLDER WITH BOOK STAND! It can hold tools, cookbooks and tablets. It also has a SLIDE OUT ARM to hold large cookbooks. Scroll down for the GIVEAWAY DETAILS. No more drops of food or liquids on my beautiful cookbooks while cooking. It is weighted with a non-skid base and has a flip down tablet holder. There is a removable crock insert that is dishwasher safe. 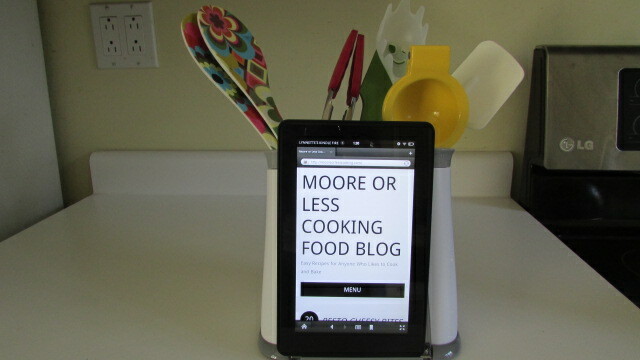 Thanks to USEFULTHINGS, one lucky Moore or Less Cooking reader will win a UTENSIL HOLDER WITH BOOK STAND! Pictured above. (tools, tablet and cookbook not included ) Many thanks to them for providing the review and giveaway product. Giveaway is open to U.S. Readers. Deadline: Wednesday August 6, 2014 at 11:59pm EST. Disclaimer: Usefulthings.com sent me this product and is mailing the prize out to the winner of the giveaway. My opinions remain entirely my own, as always. Filed Under: Give Away!, GIVEAWAY Tagged With: Giveaway! 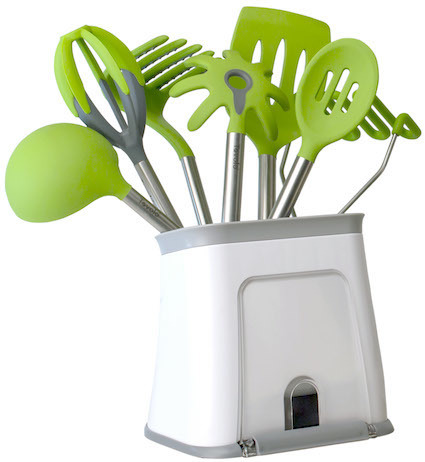 !, product review, review, UTENSIL HOLDER WITH BOOK STAND & GIVEAWAY! My favorite kitchen tools are my two chef’s knives I brought back from China when I lived there. They are so nice. This holder is really neat. I love my silicone spatulas. My favorite kitchen tool is my Ninja 3-in-one. I sure makes things easy. I’m a fan on facebook….LOVE your site! Thanks for the opportunity. My favorite kitchen tool of the moment is my Nutribullet. I have subscribed to More or Less Cooking by email. I follow on Facebook. My favorite kitchen utensil is my mini chopper. I use my cookie scoops all the time! My favorite kitchen tool is my KitchenAide stand mixer!! I love it, love it, love it! I love my Kitchen Aid 6 Qt. mixer! I love your recipes too! Please keep them coming!